I met with director Luke Korem on Tuesday, March 14, 2017, at SXSW, to discuss his second documentary feature, Dealt (which I also reviewed), which just won the Audience Award for films in the Documentary Feature Competition category. An extremely entertaining and moving movie, it tells the story of blind card magician Richard Turner, who began to lose his sight when but a boy. Athletic and energetic (to the point of hyperactivity), Turner channeled that drive into cards, finding the routines calming. Now, at 62, he is renowned throughout the world for his skill, as well as for his magnetic personality. Korem does a great job capturing the magic of Turner’s magic. Here is a condensed digest of our conversation, edited for clarity. Hammer to Nail: What brought you to the subject? It’s not as if Richard Turner is a hidden figure that no one’s ever heard of, but still, I had never heard of him, so…what brought you to the subject? Luke Korem: So, a few years ago, a friend of mine said to me, “I heard about this magician, his name is Richard Turner, he’s one of the best in the world, and he’s blind.” He was like, “You’ve got to look into that, as a filmmaker.” And I was like, “Wait a minute, that name rings a bell.” So I called my dad. 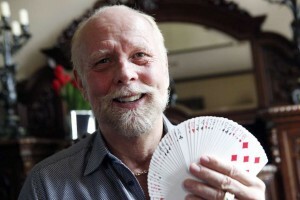 And my dad used to make his living as a professional magician in the ’80s – was pretty well-known in the sleight-of-hand community – so I called my dad and asked, “Have you heard of Richard Turner?” And he goes, “I’ve been trying to tell you that you need to make a film about this guy!” (laughs) And so he calls up Richard, who now lives in San Antonio [Texas], and I live in Austin, so I just drive on down there to meet with him and when I saw what he did, when he performed, I was just totally blown away. He had some other people who were interested in telling his story at the same time, so it was really good timing on my part, and we just gained trust with one another, and that’s where it started. HtN: Great story! Did you have any issues with access? You basically embed yourself, for a while, right in the family – or so it seems from the film – and then go out with Richard, into the world, to see how he interacts with others. Did you have any issues with permissions, or were there any concerns in the family about letting you inside their world? LK: Richard is actually a guy where you have to tell him no, sometimes. He would actually call me up and go, “I’m going in for a surgery, do you want to film it?” (laughs) And I’d be like, “No, I really don’t. I don’t want to film that.” So Richard was all in. His family, after a few months, really warmed up, and they just allowed me to bring our crew in whenever we wanted and to follow them. I would go spend the night at their house, just myself, with a camera, just kind of immersing myself so that they would kind of forget about the fact that Luke was here again, filming. And really, all credit to them for being completely open with us. HtN: That would explain the extreme comfort we them display in front of the camera, without apparent alteration in their behavior. LK: Yeah, absolutely! I would say that the first couple of months, they were kind of on guard, but then they just started living their lives, and just forgot about it, and that’s where we captured the really good stuff. HtN: So, in order to help that process along, and have them get used to you, were you most often by yourself? When did you have other crew? LK: The crew was about five of us, but I did a mixture. When we’d go on the road, all five of us would be there, with Richard, traveling with the family or performing. But then, at home, when it was just the family, sometimes I would bring another camera, and another sound operator, and then sometimes I would just be there, by myself. Depending on the situation, and if I knew that it could be emotional, or something might be happening that day for which they might not want a boom microphone overhead, or whatever, I would just do it myself. And I’m actually proud of myself that when you watch the film, a lot of it has good-quality filming and stuff, but sometimes it’s just me, and you can’t really tell apart the mixture between the scenes. HtN: Did you use different cameras when you were shooting by yourself vs. when you had a crew? LK: No. We used the same stuff. LK: Canon C300s, and then some of the footage of Richard’s card work is with a RED. HtN: That makes sense. You want that stuff to really pop. That’s a good aesthetic choice. HtN: So, given that Richard has no filter…(laughs)…were there any moments that you left out of the film, perhaps because it was too much? LK: (laughs) Oh, yeah! I mean, there are so many scenes that we had to cut. For instance, as a magician, he has to always take care of his hands, so he’ll go to the nail salon, and it’s really comical. He has this neighbor, and he walks over to her house, and they drive together to the nail salon. There are some comical things that he does. He has these lotioning things that he does with his hands…But also very inappropriate things he would say sometimes…(laughs)… like jokes. We fit some of them in the film, when possible, but a lot of them we just have to save for the extras. HtN: I have to say, one of the things is so surprising in the film is how well he takes care of himself. For somebody who can’t see himself, he’s just maniacal in his grooming. I guess he’s always thinking about his presentation of self. His focus on his appearance is so important. LK: Oh, yeah. He’s a very disciplined person, and also, with his hands, they’re just…that is his life, so his hands…he will scald them in hot water to open his pores up, then he literally dips them in a bucket of lotion, and he sleeps like that. It’s crazy. So…(laughs)…his hands are like the smoothest, most manicured things you’ve ever seen. And, you know, he’s always really meticulous about putting things exactly back where they go, dressing a certain way, because that way he can remember it. LK: (laughs) Exactly! I’ve got a little of that, too. HtN: (laughs) Yeah. And he’s also in fantastic shape, I mean, he’s a 62-year-old man, and it’s ridiculous how athletic he is. LK: Yeah, every time I’d be around, he has this way of gripping your hand, and he’d be like, “Oh, so you’re working out, now.” And I’d be like, “Yeah, I am.” I mean, I was definitely inspired to get even in better shape just being around him all the time. HtN: It’s impressive. Did he teach you any magic? LK: He did! I actually grew up performing with my dad, but he taught me one of his card-mechanic skills, which is a one-handed shuffle, and so I spent about six months with him, learning that, on the road. So yeah, I can do a one-handed shuffle! That’s cool. HtN: Did you see parallels between your relationship with your dad and Asa’s [Asa is Richard’s son] relationship with Richard? LK: (laughs) Good question! Uh, yes. My dad, who is really gifted with magic, taught me, as a young boy, and I could tell he kind of wanted me to follow in his footsteps, as well, and as a teenager I just didn’t want to do it anymore. I wanted to do film. So I could tell what Asa was like growing up. I’m like, “Come on, your dad wanted you to do this, too.” And it took him a while – the first year, he never let on, saying, “No, that never happened” – but as I got to know them more, in the next interview, he was like, “OK,” and I got all this great archival footage of them. HtN: That’s interesting, because clearly Asa and his father have a very loving relationship, right? It’s a loving family, but there is a level of codependency there, between them, and I was so happy to see Asa go off to college. I love this man and I love his family, but just go, Asa, and build a life of your own. Did you ever consider pursuing that potentially slightly unhealthy aspect of the relationship? LK: What’s amazing is that Asa genuinely is one of the most patient and giving people I’ve ever been around. I mean, we didn’t hold anything back, in terms of conflict. There are like two scenes of conflict between Richard and Asa. That’s really what you get, with Asa. You know, he makes that face a couple of times and gets frustrated with his dad, but that’s about it. He just loves his dad so much, and so we knew, before Asa moved to college … we were thinking, “Man, I wonder what’s going to happen?” And when people watch the film, they’ll see what happens. HtN: So tell me about the film you made before this one, Lord Montagu. Is there any sort of connection, thematically, between them? LK: No, there really isn’t. It’s more of a historic biopic film. Very different. It was the first film I directed, about a British lord who is quite controversial in England. Totally different subject matter. They’re completely different. It’s based in the ’50s and ’70s. Absolutely nothing to do with this film…BUT…it helped me get this film because, when I met Richard, he was like, “Look, I like you, you have a background in magic, but I need to know if you can make a film, so send me the film that you made and I’ll watch it.” So I sent him my film, and he grew up with this guy who co-created Home Improvement – he’s one of his best friends – and he watched Lord Montagu and said, “Hey, this is a good film. This team is good. Go with them.” So, one thing leads to the next. HtN: That’s the way it always is. So your previous gig got you this gig. LK: Yeah. And I’m very proud of that film, let’s just say. Lord Montagu is very good, it’s just a completely different type of film. HtN: Got it! Well great job with the film. Thanks for chatting with me. LK: Thank you so much for having me!